If you can’t get the information from Apple, why not try Foxconn? Apparantly, that’s the right tactic to get the release date of the new iPhone. And this time, a Foxconn HR says it’s October. "We just got the order. It [the release] will be around October," the head of human resources at Foxconn's Taiyuan factory said for South Korea's Maeil Business Newspaper. To back up the rumor, comes a massive head-hunt apparently going on in Taiyuan. Another media outlet, The Maeil Business Newspaper, phoned the local Foxconn factory that’s said to have been contracted for the new iPhone and it confirmed that it’s hiring big. "Yes, it's true we are hiring a large number of workers," the human resource manager said. Disappointing for those who’d already marked the summer as a “break the piggy bank day,” but just in line with the release of the 2011 iPhone. Of course, this kind of rumors may or may not be based on reality, so take them with the grain of salt usual for Apple. ill be checkin out Windows 8 tablets from my SGS3 in october. Apple better bring some heat with the i5 and seriously change things up or they are going to start to be in some real trouble, especially if the ipad3 sales are a future indicator. iPad 3 sold a record 3 million in one weekend. It's sales are great no matter how much you wish it to not be so. sales are not a direct correlation to quality. are we always going to have the same arguements over and over, troll? True that's only part of the equation. You have to consider price point. Android gets market share by selling cheap junk. Customer satisfaction where Apple leads by a mile. How likely a customer is to switch? Again iPhone customers are least likely to change OS. iPhone leads in every single way you look at it. All the data points to the fact it's the best phone on the market overall. The galaxy s3 Will have a firm strangle hold of the market by then so apple could be slipping up. That saying every ifan is going to buy it even if it ends up being nothing more than an iphone 4$$ as its a new apple product. WTF is up with Apple! I don't know if I'm the only one who notice but everytime MS has some major release date set, Apple crashes the party. First the iPad 2 and now the iphag, oops phone! Do I smell fear? I don't smell fear, I smell immaturity. Reported your comment. It feels good to vent about BS like Apple is doing, which is immature. I should vent about foxconn too! s**t Apple has enough money to bail the US government out of debt yet their employees get treated like s**t. Dumbazz like you support bullcrap. You don't see JoBs and his Apple cohorts give money to charity or anything like bill gates. Talking bout it makes me mad even more! I'm not talking about your venting, I'm talking about your little "iphag" comments I've seen a few times, THAT is immature. Does anyone know if the "New" iPhone will have LTE; iMean iWiFi; iMean 3.5 G; iMean HSPA+; iMean 2G (in fine print); iDon't know what iMean.... iGuess we'll have to wait for the fine print. lol, the 4S apparently already has 4G, or at least that's what the status bar says since Apple replaced the 3G with 4G. 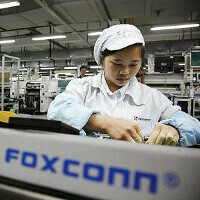 Shouldn't FOXCONN HR be worried about employee safety, compensation, morale etc. and not leaking launch information from their biggest client? They don't give a dam perhap's.... but smart thinking! The next iPhone may or may not be a revolutionary device. But I will bet everything I own that it will still dominate. I've heard the haters on these forms plug one Android model after the next claiming that when it gets released it will the best thing since toilet paper..... It won’t.. .it will never sell better than the iPhone regardless of spec. The average person can care less about specs. It’s all about popularity and design. Apple's Marketing team is a genius at selling their products. Android fans can argue specs all they want. After WP8 comes out Android will eventually become a thing of the past. I say this because developers are already tired of creating apps for this OS. In my opinion WP8 will never gain the popularity of the iOS with the iPhone resulting is Apple remaining the top smartphone and tablet producer. You're a troll. If the iPhone wasn't a great phone it would not sell so well and would not have record high customer satisfaction ratings. That's because they buy a brand, not a device. Once you buy it you still have to use the phone. If people didn't like it they wouldn't keep buying it. by that Android is 2x the quality of iOS since it has 2x the marketshare and GROWING its lead on iOS. Android is selling well no matter how much u want to think its not. lolz. bad troll... sit troll... stay troll. Name one Android phone that does better then the iPhone... Stop lumping 100 phones together as if they are only one.